Dr. Lawrence “Randy” Lozada, a graduate of the University of the Philippines College of Dentistry and a practicing dentist from Valencia California, personally delivered a digital x-ray dental sensor to D4EVF. In March 2018, Dr. Lozada was a last minute volunteer to a D4EVF dental mission held at Calumpit, Bulacan, Philippines. At that time, the volunteer corps thought he was there just to give a hand and observe how the Foundation run its dental missions. Unknown to D4EVF, he was there to assess their needs to make their delivery of service far better. 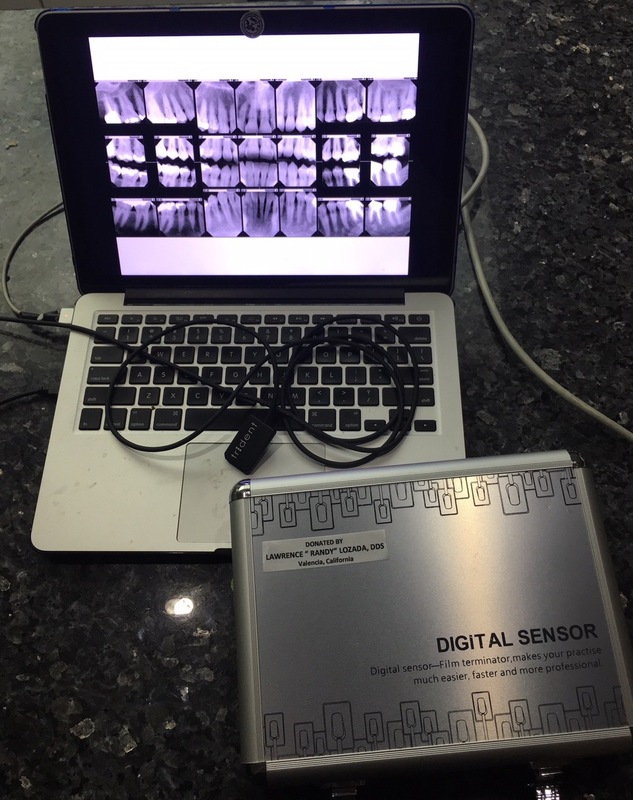 Apparently, he saw how volunteer dentists struggle with just one digital x-ray sensor that is shared amongst the diagnostic, endodontic and oral surgery sections. Dr. Lozada chose to end that struggle, or at the very least aid in getting through it easier. He donated a dental sensor. As luck has it, D4EVF recently received a large donation from another graduate of the University of the Philippines College of Dentistry, Dr. Marifi Maghari- Pipkin. Dr. Pipkin practices at Apple Valley, some two and half hour drive west of downtown Los Angeles in the high desert area of Southern California Dr. Pipkin’s recent donation is her second large donation to the Foundation. Late last year, she gave a large donation that allowed the D4EVF to fully equip the dental lab of the charity clinic they build at Parañaque City, Philippines. To commemorate her donation, the lab was named after her and her husband, Joseph Pipkin. The donation of Dr. Maghari-Pipkin allowed the purchase of a high-speed laptop computer that will run the digital x-ray sensor from Dr. Lozada. There are a number of benefits with digital x-ray systems. Most notably is the reduced radiation exposure for patients. While this is rarely a concern for most dentists, patients normally view such positively. Another advantage of digital radiography is the ability to view the x-ray in a computer screen allowing a better and a larger view than that of a regular film x-ray. This gives the dentist an added aid in planning and/or explaining treatment plans to a patient. Image manipulation is also available on these digital systems, which can improve early diagnosis for certain conditions. More importantly, there will be no need to use chemicals to process x-ray images thereby saving the environment from pollution.